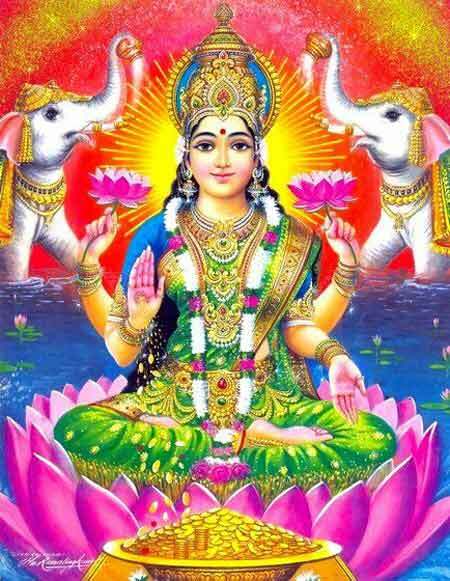 Goddess Lakshmi is depicted in four colors – body tone. There is deep symbolism attached to the various colors associated with Goddess Lakshmi, the goddess of wealth and prosperity in Hindu religion. In scriptures associated with Hinduism, She is described as dark (blue), pink, yellow and white colored. When a painting or image of Goddess Lakshmi is dark or blue she is the consort of Vishnu. This is because Vishnu is dark (blue) in color. When Goddess Lakshmi is described as having yellow color, she is associated with wealth. In White color she represents nature – it is from this form the universes and all living and nonliving appear and disappear. Pink color represents a compassionate form of Goddess Lakshmi – She is the mother to all living beings. It must be noted that modern paintings and pictures of Goddess Lakshmi do not follow any symbolism. She is pictured merely as a Goddess of wealth. Why Hindu Gods have Blue Color?